Continue — this button continues the execution of the Debugger till the next breakpoint. If there are no breakpoints, the Debugger executes the log till the end and closes. Stop Debugging, the Shift+F5 hotkey — this button stops the execution of the Debugger and closes it. The navigation with steps allows you to explore the execution flow in deep details with all the related and the depended data — stepping is executing the code one line at a time. Step Into, the F11 hotkey — if a method calls another method, use this option to move into this method. 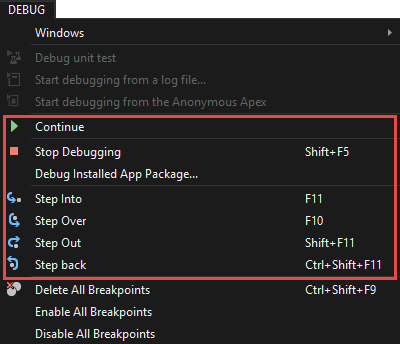 Step Over, the F10 hotkey — use this option to execute a step as a unit, without stepping in other methods if there is such step. Step Out, the Shift+F11 hotkey — it allows to move out of the method that was called by another method and go on a higher level. Step back, the Ctrl+Shift+F11 hotkey — in case you missed some necessary point, you can easily go back through the execution context. Show the next statement, the Alt+Num * hotkey — this option shows the next statement that will be executed. It is especially helpful when you explore the call stack and have lost where the process is now. 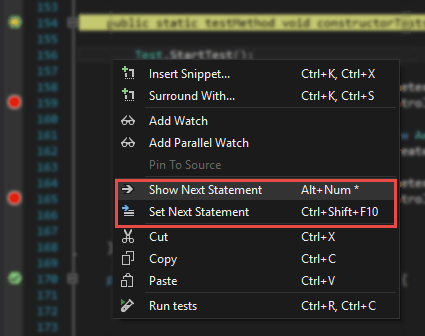 This option is also available from the context menu if a test method is in the Debug mode. Here you also can select Show the next statement or Set Next Statement (also with the Ctrl+Shift+F10 hotkey). In addition, all these options are available from the Main Menu item Debug.